Photo courtesy of Scott Gilbert. 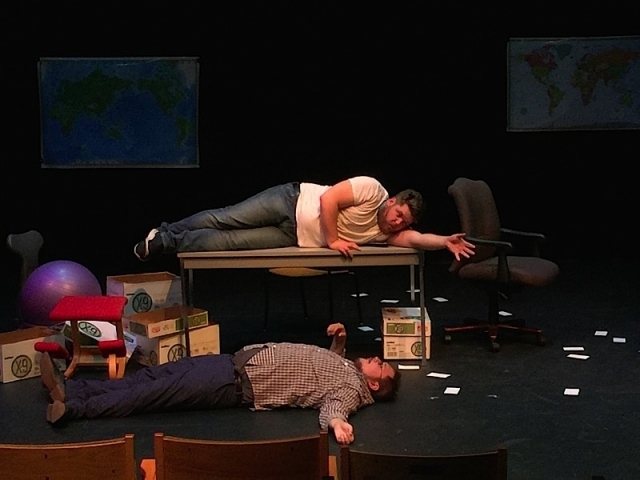 Thomas Buan and Chase Adelsman are matched perfectly in Amy Seham’s clever contemporary eco-play about a gay schoolteacher who runs for city council at the urging of his students and spurred on by his enthusiastic straight brother/campaign manager. Their core issue is to save the environment, but they disagree on just how to present their concerns to the voting public. The production whimsically weaves in motifs reflecting Don Quixote and Sancho Panza. The analogy between the contemporary American brothers and the archetypal pair penned by Spaniard Miguel de Cervantes four centuries ago makes sense and works nicely. Scott Gilbert has directed Fools, Errant with a kinetic zeal that infuses the actors’ sparkling performances. They embody the problem of idealistic political aspirations pressured into understating the gravity of the issues for the sake of appealing to voters. That said, we are given hope with the possibility of an intervention by a superhero. The production has the uplifting quality that we experience in the more vibrant moments of the classic Don Quixote musical, Man of La Mancha.